All the monthly global data sets are updated now. The University of Alabama Hunstville (Spencer-Christy) MSU satellite derived lower tropospheric data shows an anomaly of just +0.015C. 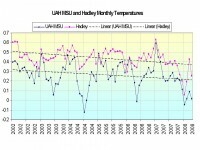 The UK Hadley Center version 3v which includes land station and some ocean reports showed an anomaly of +0.265C. Adding this month to the plot since 2002 shows the downtrend continues. NOAA reported the combined average global land and ocean surface temperatures for April ranked 13th warmest since worldwide records began in 1880. However as numerous peer-reviewed papers have shown in the last few years, the global (and even the United States) data sets overestimate the warming by as much as 50% because of data dropout (see John Goetz post on Climate Audit here), the downplaying of the importance of urbanization (thanks to the acceptance of flawed papers by Peterson and Parker) and because as Anthony Watts and Roger Pielke Sr. have shown, there is poor siting of many of the instruments and improper documentation and adjustments for land use changes around the sites. The ocean data sets have their own set of issues as the methods (buckets, intake tubes and now satellite) have changed over the years. Hadley only includes data from merchant ships and noted that its ocean coverage is limited to regularly traveled ship routes and vast areas of the oceans (which make up 71% of the globe) are unaccounted for in their analysis (especially the southern oceans and a look at your globe will show you that the Southern Hemisphere is mainly ocean). Satellite data which senses over land and sea has the best coverage and is the most reliable, consistent and objective but is available only since 1979. There has no doubt been some cyclical warming from 1979 to 1998, but it has been exaggerated by the poor station or ocean data. The state records as documented by Bruce Hall in 2007 tell the story. Scroll down to see the monthly records by state and link to other states. 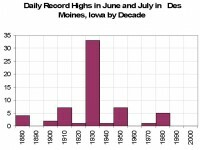 Most all of the heat records were set in the early half of the 1900s. 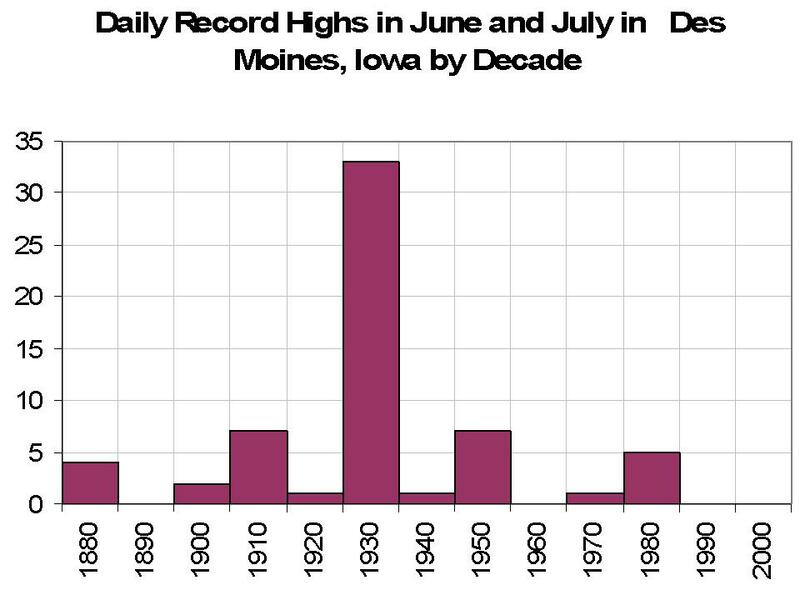 A plot of Des Moines, Iowa June and July record highs by decade graph says it all. These tables and chart show that the current warming is clearly not unprecedented as alarmists claim, not even in the last century. I believe that if we had satellite monitoring for the last 120 years, we would see the recent warming though real, fell short of that in the 1930s and that the changes are cyclical and thus primarily natural in origin. That is not to say that cities have not grown warmer as they have grown and some warming through the population growth from 1.5 to 6.5 billion since 1900 has taken place nor that we shouldn’t be better stewards of our environment, only that man-made greenhouse warming as portrayed by the agenda driven alarmists, the mainstream media and the IPCC is a fraud.